With the ever-expanding dorm room market (and the ever-shrinking dorms! 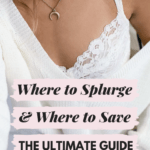 ), making a space your own while conserving and utilizing precious space has become increasingly difficult – but with a little creativity, it’s possible to turn a boring, standard-issue dorm into an amazing space. 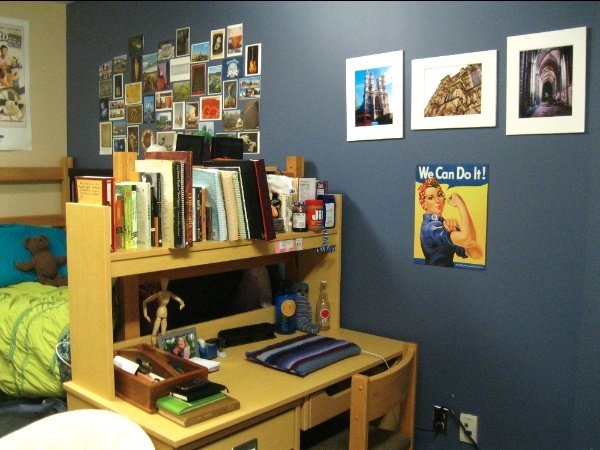 In this new series entitled Dormspiration, we’ll be showcasingthe very best dorm room decor, proving that it is possible to transform a 9′ x 12′ empty space into a room you can truly call your own — all on a college student’s budget! In this first installment, we’ll look at three beautifully decorated rooms, each uniquely furnished by their inhabitants. 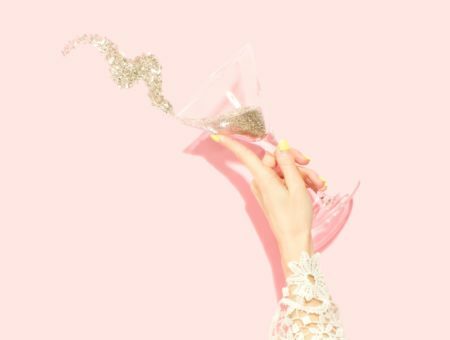 Emily focused on a clean color scheme, letting images and quirky decor speak for themselves, Mallory and Allegra used an eclectic blend of colors and materials, and Andy proved that men can (and do!) decorate their rooms with taste and class. Let’s get started! 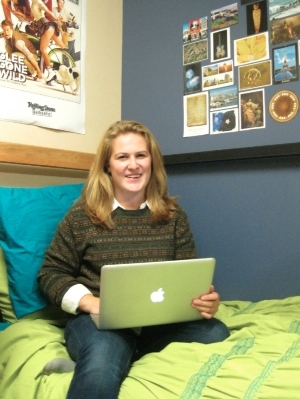 Emily’s side of her double room at Oberlin, based around a clean color scheme of blues and greens, perfectly reflects her pensive personality. The gorgeous collage of pictures and postcards adds so much visual interest, and contrasts wonderfully with the simply matted prints and Glee poster on the opposite walls. If you look closely, you’ll see all of Emily’s unique pieces that bring so much life and creativity to her room: everything from her knitted eggplant to her vintage desk accessories. The coolest thing is that she makes all of her knitted decorations herself! Emily is one of my best friends, and I’ve always been in awe of her impeccable taste. 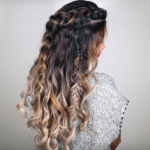 Read on to see what inspired her dorm style! 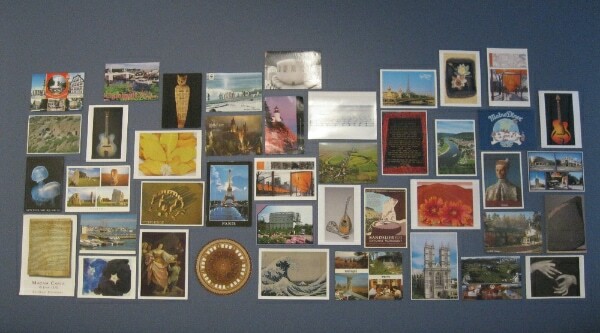 Emily’s collection of pictures and postcards are grouped into a simple collage that showcases her interests perfectly. Did you have a theme in mind when you set out to decorate your room? How did you achieve your room’s look? What are your favorite pieces in the room? 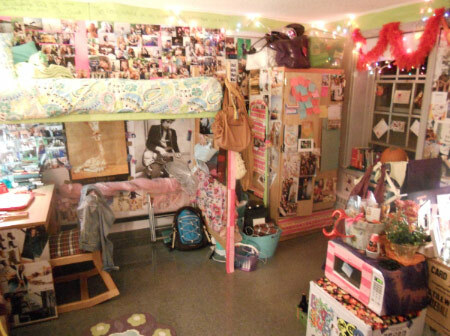 What are your tips for decorating on a college student’s budget? 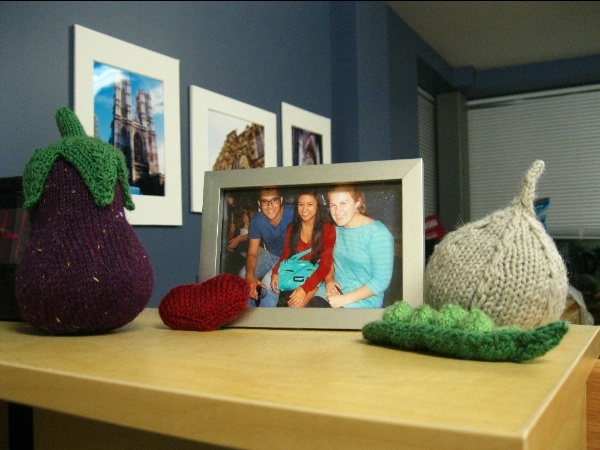 Emily’s hand-knitted pieces are probably my favorite part of her room. Mallory (left) and Allegra’s (right) room is covered in everything imaginable, from photos and posters to magazine covers and wrapping paper. Their creativity and love for art and clothing is perfectly reflected in their room design, and their styles complement each other seamlessly. You could stay in their room for hours and not see everything that they’ve added to their dorm — and that’s just the way they want it. According to the two roommates, they’re constantly adding things to the walls, and are always on the lookout for new pieces. When I first stopped by their room one Saturday night, I was immediately struck by how different it was from any room that I’d ever seen, and I just had to ask them about their interior design style! Mallory’s side of the cozy double. Allegra’s side of the room. Does your room have a theme? Did you have a color scheme in mind? What are your favorite pieces, and where are they from? 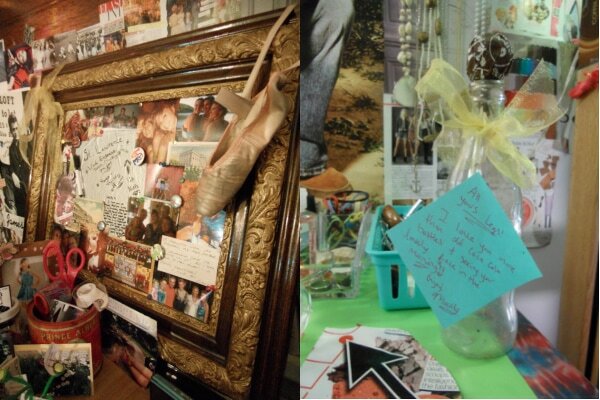 Left: Mallory’s bulletin board made from an antique frame, with her friend’s ballet slipper dangling over the top. Right: Allegra’s vintage Coca-Cola bottle, a gift from Mallory, adorns her dresser with a cute yellow ribbon and Tootsie Roll Pop. Left: Mallory’s jewelry collection is artfully organized above her dresser in a simple bulletin strip. 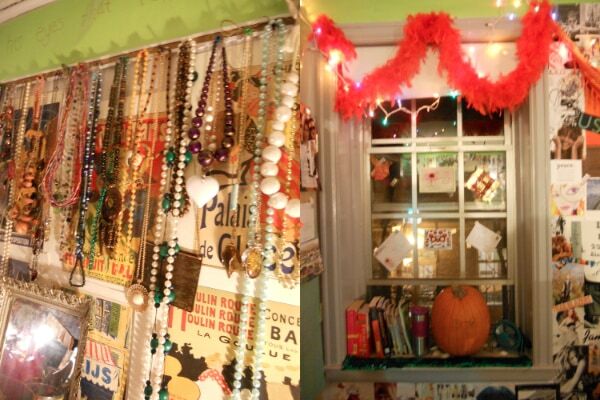 Right: Allegra’s window reflects her personality perfectly with quirky details like the Harry Potter pumpkin and seashells. 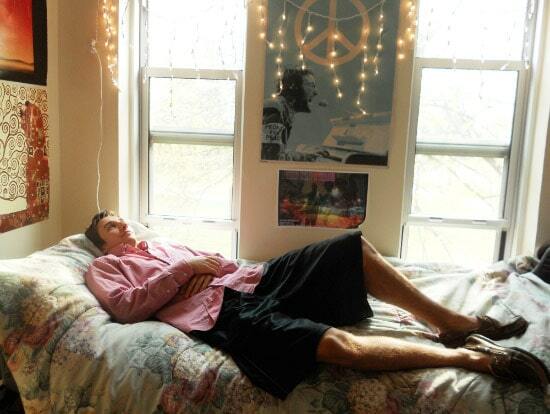 Andy’s room is the epitome of a classic, tastefully decorated dorm. There’s a tremendous shortage of well-put-together men’s dorms, and when I heard about Andy’s room, I had to go see it for myself. 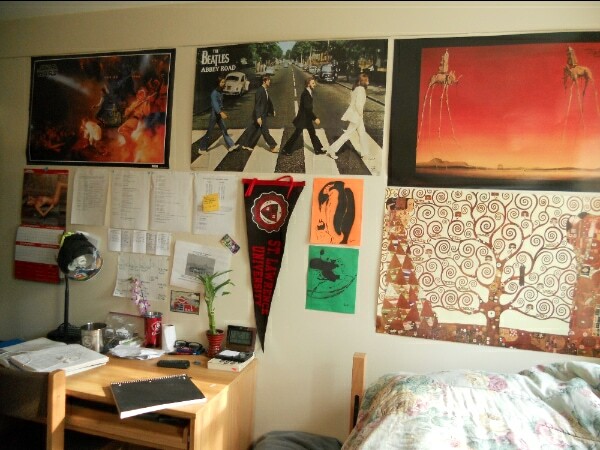 Andy uses similar-sized posters and a number of unique elements to make his dorm his own, utilizing white space and symmetry. 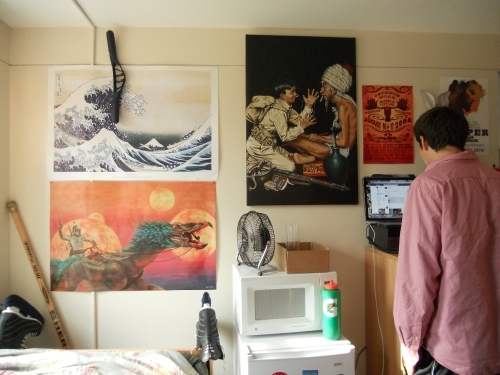 It just goes to show that a guy’s room doesn’t have to be bare or decorated with a solitary Sports Illustrated poster — dorm design should never be exclusively a “female” thing. Andy’s room is a room that everyone wants to hang out in, and partly because he put effort into making it more than just a place to sleep and do homework. Andy uses a lot of preppy elements in his room like the St. Lawrence pennant and Salvador Dali poster — and who doesn’t love a guy with a floral comforter? Andy: as preppy and chill as his room. 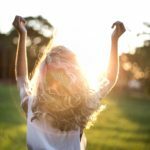 Want to be featured in an upcoming Dormspiration post? Would your room medal if dorm room design was an Olympic event? 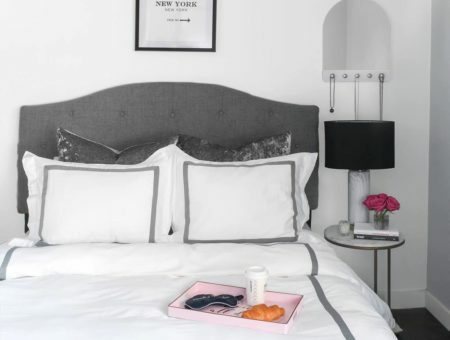 Is your apartment an interior design haven? We want to know about it! 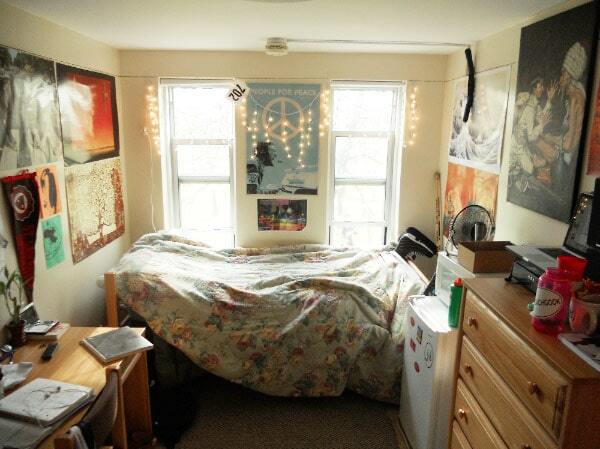 If you’d like to be considered for a Dormspiration article, email 1-2 photos of your room or apartment (bonus points if you can have a friend take a photo of you in your room!) and a brief description of your design to [email protected]. Can’t wait to read your submissions! How did you like the first installment of the Dormspiration series? Which room was your favorite? What are your best tips for decorating on a budget? Let us know with a comment! Previous Quiz: Which Social Networking Site Inspires Your Interior Design?